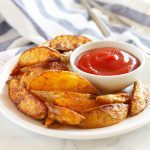 These Crispy BBQ Potato Wedges are the perfect summer side dish - crispy on the outside and soft on the inside, with deliciously smoky BBQ flavor! Preheat your oven to 425 degrees Fahrenheit and prepare a large baking sheet, greasing it with 1-2 tablespoons vegetable oil. Slice the potatoes into wedges and add them to a large bowl. Add the seasoning salt, paprika, garlic powder, pepper, and cayenne to the bowl, along with the 1/3 cup of vegetable oil. Toss the potatoes, spices, and oil together until the potatoes are well coated. Pour the potato wedges onto the prepared baking sheet and spread them out in a single layer. Bake the wedges at 425 degrees Fahrenheit for about 22-25 minutes, or until the wedges are golden brown. Remove them from the oven and enjoy immediately with ketchup for dipping, or your favourite dipping sauce! Make sure your oven temperature is hot - use an oven thermometer to ensure your oven temperature is 425 degrees Fahrenheit. Use the convection setting on your oven to avoid having to flip the potato wedges halfway through baking. If your oven doesn't have a convection setting, flip the potato wedges halfway through baking to ensure even browning.